With countless energy bars on the market, the Promax Bar stands head and shoulders above the rest because of its protein, carbohydrate, and fat content, and great taste. 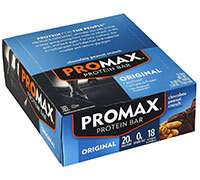 "The Promax Bar is one of the best tasting bars on the market!" The Promax Bar has been elevated to "candy bar" status by many consumers because of the great taste, but we would like to emphasize that this is a high protein bar, designed for the hard working individual. The Promax Bar also has excellent texture. Our phenomenal texture is due to the soy chips we have added to the formula, which also enhances the protein content. Promax Energy Bars are made with natural ingredients and contain no artificial flavors, sweeteners, colors, preservatives, or hydrogenated oils. INGREDIENTS: PROMAX® PROTEIN BLEND [SOY PROTEIN ISOLATE, SOY PROTEIN CRISPS (SOY PROTEIN ISOLATE, RICE FLOUR, BARLEY MALT EXTRACT, SALT), SOY PROTEIN CRISPS (SOY PROTEIN ISOLATE, TAPIOCA STARCH, SALT), WHEY PROTEIN CONCENTRATE, CASEIN, CALCIUM CASEINATE], GLUCOSE, CHOCOLATE FLAVOURED COATING (SUGAR, FRACTIONATED PALM KERNEL OIL, COCOA, WHEY, SKIM MILK, SOY LECITHIN, FLAVOUR), FRUCTOSE, PEANUT BUTTER (PEANUTS), SUGAR, WATER, PARTIALLY DEFATTED PEANUT FLOUR, FLAVOUR, MALTODEXTRIN, SOY LECITHIN, GUAR GUM. CONTAINS: SOY, MILK AND PEANUTS.